Since 1978 we have been a full service RV dealer in South Carolina that is proud to offer customers the best people, the best travel trailers, fifth wheels, and class A, B and C motor homes, the best sales prices, and the best parts & service before and after each sale. This family owned business and dealer, located in Lexington, South Carolina, is run by John, his four sons, and three grandsons. 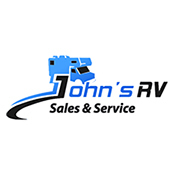 Here at John's RV, you will receive personal attention and individual service. You will come to our SC store for our sales prices and our new and used Forest River, SunnyBrook, Keystone and other RVs, but you will stay for our service. We will not be undersold to anyone. At our dealership in South Carolina we specialize in RV sales. We offer a wide variety of new and used RVs, Class A Motor Homes, Travel Trailers, and Fifth Wheels from manufacturers such as Roadtrek, Forest River, SunnyBrook, Keystone and Palomino. Take advantage of our professional RV service department and our extensive parts collection that we offer at our SC location, too.